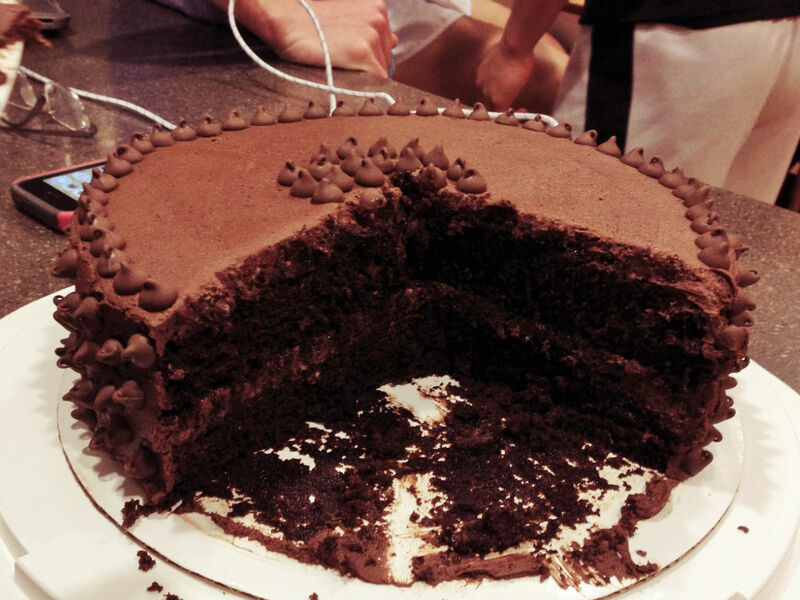 The cake is a devil’s food cake recipe, and uses your basic cake-making process of mixing your dry ingredients and wet ingredients separately, and then combining the two. So, while this cake is pretty straightforward and easy to make, the result is anything but ordinary. Sometimes I wonder if there is such a thing as too much of a good thing. This cake confirms it: No – there is not. This cake is loaded with chocolaty goodness. 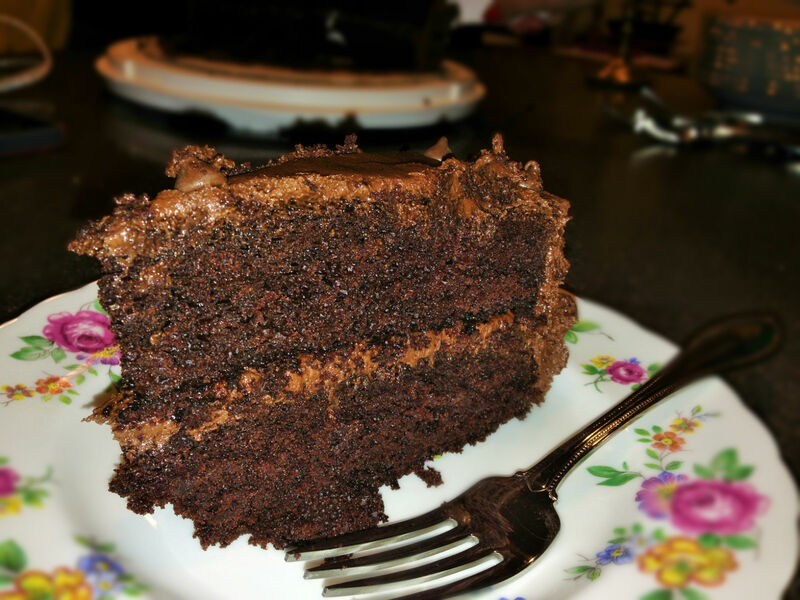 The oil in this cake makes it more moist than butter would, and the abundance of chocolate makes it irresistible. 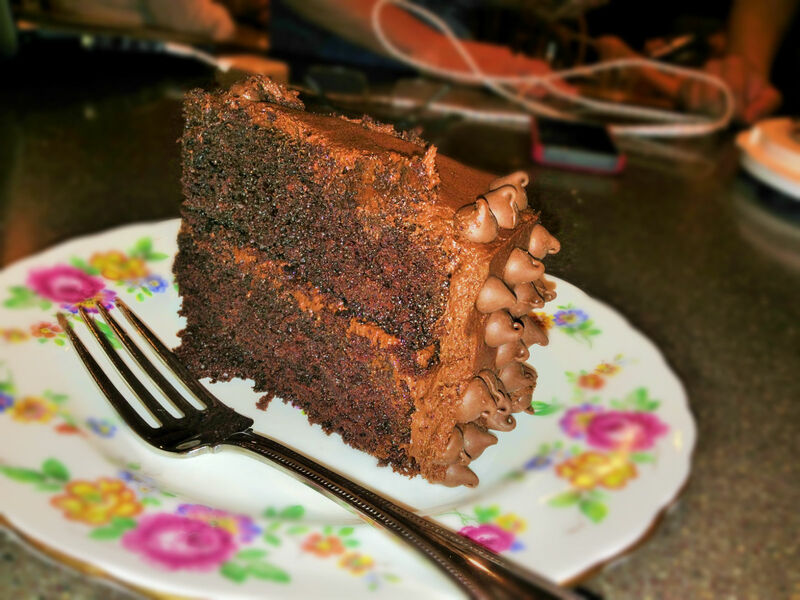 As for why it’s called a Triple Chocolate Layer Cake? 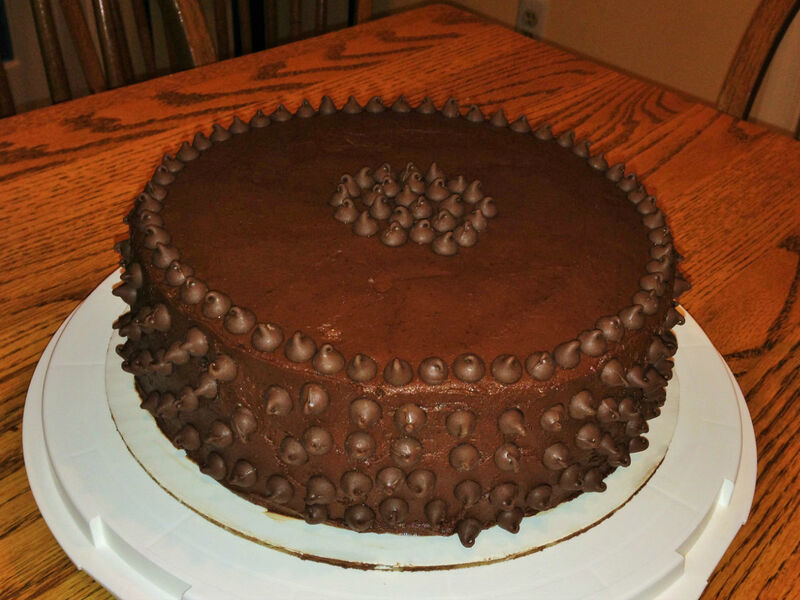 It has chocolate x 3: Chocolate cake, chocolate frosting, and chocolate chip decoration. I know; if you ask me, triple chocolate implies 3 separate types of chocolate being used, but I’ll let that slide. This cake can be called Quintuple Chocolate Layer Cake, for all I care. It is decadent and moist enough to get away with it. I think it’s time for me to stop typing and get back to baking. So, I’ll leave you with this recipe. I’m off to the kitchen. Preheat oven to 350F degrees. Butter & flour two 8 or 9 inch round cake pans, or use non-stick spray. For the cake: Sift together the flour, sugar, cocoa powder, baking powder, baking soda, and salt in a medium sized bowl. Set aside. Using a handheld or stand mixer with paddle attachment on high speed, mix the buttermilk, oil, room temperature eggs, and vanilla in a large bowl until combined. Slowly add the dry ingredients to the wet ingredients with the mixer on low. Add the coffee. The batter will be VERY thin. This is ok.
Pour the batter into prepared baking pans and bake for 23-27 minutes or until a toothpick inserted in the center comes out clean. (My cakes took 25 minutes.) Allow to cool before frosting. For the frosting: Cream the butter with a handheld or stand mixer on medium speed for 3-4 minutes until creamy. Add 3 cups of powdered sugar and 3/4 cup of cocoa powder. Mix on low. Add 3 Tablespoons of heavy cream and 1 teaspoon of vanilla extract. The correct frosting consistency should allow a spatula or knife inserted in a bowl of frosting at least 2 inches thick to stand up straight when you gently shake the bowl. (There are many YouTube videos demonstrating this is your are unsure.) If your frosting is too thin, add up to 1 more cup of powdered sugar. If your frosting is too thick, add up to 2 more Tablespoons of heavy cream. Add at least 1/2 teaspoon of salt. Taste the frosting and add more salt if the frosting is too sweet. Add more cocoa powder if the frosting is not chocolaty enough. 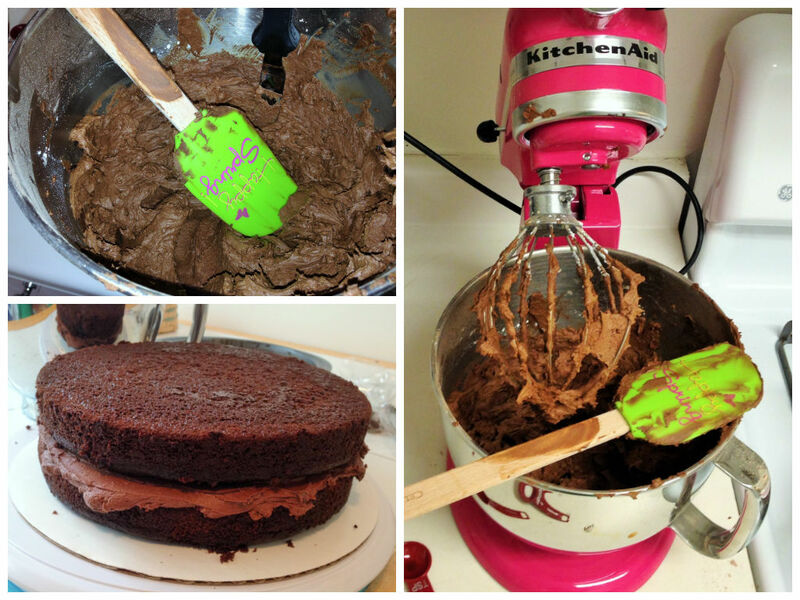 The frosting recipe is forgiving, so add more/less of each ingredient to obtain the consistency and taste you desire. 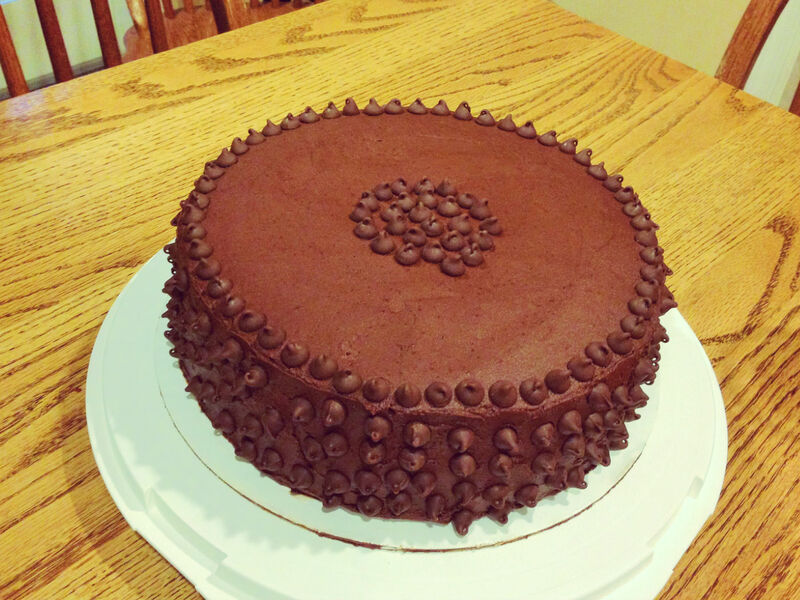 Cake stays fresh, moist, and soft at room temperature (covered) for up to 4 days. Cake may be refrigerated (covered) for up to 7 days. *If you don’t have buttermilk and want to make your own, measure 1 Tablespoon of lemon juice or white vinegar in a measuring cup and add enough milk (1%, 2%, or whole) to that cup to reach 1 cup. Stir it around and let it sit for 5 minutes, and then your homemade “buttermilk” will be somewhat curdled and ready to use! Sally adapted the cake recipe from Ina Garten; frosting is a sallysbakingaddiction.com original. « Be Healthy. Be Happy. Eat Chocolate.